There is a talk about Scotland being independent. If that happens, what would the Scottish Army's ranks and insignia would look like? The talk I've heard is that they will still maintain the British monarchy, so I doubt they'd change it too much. They'd probably adopt a different star than that of the Order of the Bath, probably the one used by the Scots Guard. The thistle would probably be incorporated as well. If they were going the republican route, than it would probably replace the crown. They might replace brigadier with brigadier general just to be different, or because the size of the military might be so small as not to warrant anything higher than an OF-6 and they want 'parity' with other services. All in all, I don't expect an independent Scotland's military to be too different than the UK's. My guess is they would look very close to the UK's insignia, but with a slight variant. I am not sure how long an independent Scotland would retain the monarchy being that the Scottish National Party is openly republican. So it is entirely likely that the insignia would not incorporate the crown. Furthermore in order to make independence sound appealing to a Scottish public that is largely opposed to the idea it has been watered down to the point where it has become little more than increased autonomy. Some plans call for the UK to continue to handle defense and foreign affairs and to keep the British Pound, dual citizenship, etc. Most polling only shows independence with 25-35% support. ijnfleetadmiral wrote: My guess is they would look very close to the UK's insignia, but with a slight variant. probably like other former british countries like Nepal and Ireland which are obviously british inspired but still distinctive enough. I concur. 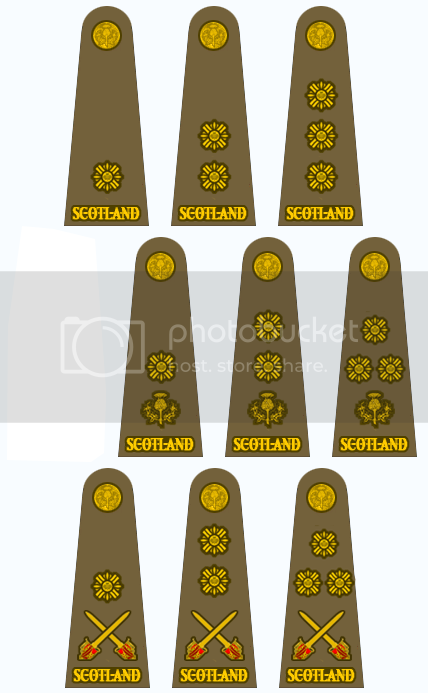 The rank insignia of army of the Kingdom of Scotland would look EXACTLY like the British, but with the differences you saw in pre-1968 Canadian and modern Australian and N.Z. uniforms: SCOTLAND shoulder titles, slightly different stars (pips), slight variations in the Crown and related tiny things. The army of the REPUBLIC of Scotland would follow the Irish example, of looking British but having some deliberate variation (e.g., look at Irish other ranks' insignia). While rank structure and insignia layout might be very well based on the British system, what national heraldry would they use for republican Scottish insignia? Lions rampant for higher ranks such as generals? The Order of the Thistle as a source for other officers? Then there's the question of uniforms. Would all services wear the tartan? It's likely to be an academic question only; at the moment, the polls are broadly 30-35% who say they would vote "yes" to independence for Scotland and 55-60% who say they would vote "no" to independence. I have not yet heard a cohesive argument for what currency an independent Scotland would use, let alone how their defence and foreign policy needs would be met. Having said all that, in the hypothetical event that a "yes" vote occurs, an independent constitutional monarchy, with the expectation of membership of the Commonwealth, the EU and possibly NATO (although all that would have to be negotiated and agreed...) would seem to be the most likely outcome. In that event, it seems likely that rank insignia would broadly retain their current British configuration but the use of St Edward's Crown and the star of the Order of the Bath would be amended to the Scottish Crown and the star of the Order of the Thistle -- as others have noted above. This would apply to all ranks, as appropriate, with the crossed sabre-and-baton for general officers remaining unchanged. Similarly, the Scottish Crown would replace St Edward's Crown above the chevrons for Staff/Colour Sergeants and as the insignia for WO2. WO1 would change to the Scottish version of the Royal arms. There are, of course, plenty of other options but that is by far the simplest and least disruptive way to change things. It's always possible that something completely different could happen and an independent Scotland might follow the Canadian model of a unified defence service with simplified universal rank markings for all branches. That would also be relatively straightforward to achieve, has other precedents within the Commonwealth and has the political advantage of making Scottish forces personnel uniquely different from their remaining British counterparts. Adopt the Canadian system wholesale, swap any appearance of the maple leaf for a thistle and, again, change all appearances of St Edward's crown for the Scottish Crown and the Royal Arms of Canada for those of Scotland and you're pretty much there. This is, however, is just the final window-dressing; the more important question is how such a newly independent state would constitute it's defence forces and how would (or could) existing units of the UK armed services be split up and transferred to become specific Scottish forces. Like the economic questions, I've not yet seen a cohesive proposal as to how all this would be achieved. I'm a Brit and I've lived and worked in Scotland. There has always been an interest in increasing autonomy and independence but while the majority wanted the former (and pretty much got it with devolution a decade or so ago) the latter has never really had anything approaching true majority support. I doubt that British style would be kept in a republican Scotland. Maybe a sort of merge between modern German/Italian/Spanish/French style and British style: the most important change would occur to insignia for field officers (Major to Colonel). Thus, Major would be assigned current Lieutenant Colonel insignia (whistle and St. Andrew Star), Lt. Col. would adopt current Colonel insignia (whistle and two stars), while Colonel would adopt current Brigadier insignia (whistle and three stars). Marcpasquin's chart is about 90% of what I had in mind. I was wondering if they'd incorporate the original Claymore in lieu of the basket hilt one. Nice work, Marc -- like those a lot! The historical claymore longsword would work too but I rather like the basket hilt broadsword just as you have used it. It's distinctive appearance and well-recognised connection with Sottish troops make it a great choice. 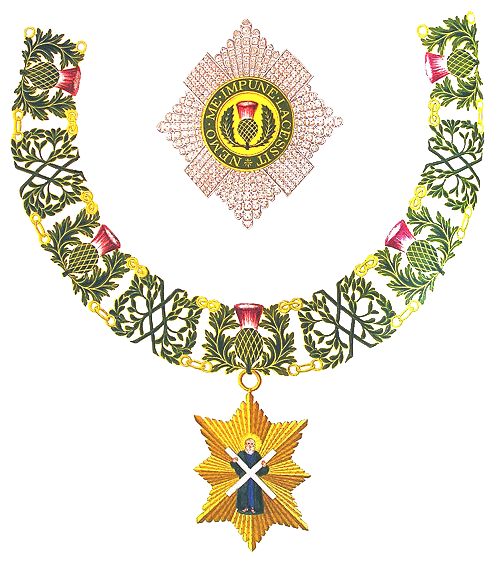 It occurred to me that the star of the Order of the Thistle, with all of its monarchist connections as an historical order of chivalry, might not be the first choice of a republican independent Scotland. I guess it depends how much they might truly want to break all links with the monarchy or how much they will accept and use such historical emblems. Having said all of that, with opinions in Scotland as they stand at the moment, I still don't really see any real likelihood of a rush to independence, let alone a republic, for the foreseeable future. I am very sorry for the low quality of the work, but I am barely able to run GIMP. I moved from excellent marcpacquin's work. In this proposal, senior ranks lose the rank of Brigadier (and get that of Brigadier General): due to the low population of Scotland, I really doubt that a full General would be necessary. However, the major change is in the field ranks insignia: in this case the Whistle assumes to have a value of "Captain" rank, meaning that the immediately higher rank is "Captain+1", i.e. "Whistle+1 pip", and so on. On the same grounds, crossed swords are assumed to mean "Colonel", and therefore a Brigadier General is "Colonel+1", i.e. "Crossed swords+1 pip". I like the ideas presented, but do agree on a republican Scotland probably not too keen on using the star of the Order of the Thistle. I was thinking that they might use just a saltire cross isntead. I haven't yet found a sufficiently good image of a bullion embroidered version of the Scottish Crown to post a comparison with the usual current St Edward's Crown (for rank insignia and badges) but if I find any I'll add them later. Hmmm. Can't believe I never thought of the thistle being used for caps. Wonder if they use it on gorget patches? If I remember correctly, yes, the Chief Constable gorgets used thistles of a similar style to the peaks. Thanks. I found an old picture, but it appears to be be oak leaves. Don't know when it was taken, so if you can find anything recent, we may have an answer. The catalogues from Firmin, the uniform tailors and accoutrement manufacturers, list navy blue gorgets embellished with silver thistle leaves for Scottish Chief Constables alongside black gorgets with silver oak leaves for the rest of the UK. I haven't found any decent pictures though. Given how much the thistle-pattern peaks broadly follow those of the usual UK oak leaf pattern, it wouldn't surprise me if the thistle leaves on the gorgets were all but indistinguishable from the normal oak leaves at any distance and to any but the must knowledgable observers...! Alternatively, the "Firemasters" (Scottish title for Chief Fire Officer) of the various pre-amalgamation Fire and Rescue services wore black or navy?) gorgets with a large, single thistle device. These are much more distinctive and some variation on this would definitely make a good alternative option for military use. Going back to the caps for a moment, the design of the thistles for the peak decoration for the senior fire officers would also appear to be slightly different to the police pattern -- although in appearance they look rather more like the usual oak leaves with more angular and less rounded edges. The police pattern, that includes the thistle flower-heads (as in my post above), is definitely more distinctively different. Thanks. I saw a pic of Chief Constable House, but never thought to check the fire department. I'll see if there's anything on (an alternative to) St. John Ambulance. I'll have to look for gorget pics in my reference file. It's worth bearing in mind that some of the older pics showing the thistle-type gorgets will be from the separate pre-amalgamation regional police services across Scotland. I'll try to illustrate what I mean about the style of the thistle leaves being only very subtly different to the oak leaves. This is the Scottish-pattern Chief Constable cap with silver thistle leaves. This version doesn't have the thistle flowers but the difference between this and the standard oak leaf pattern is that the thistle leaves have three lobes per side and are these are of a more pointed shape, whereas the oak leaves have only two lobes on each side of the leaf and they are of a rounded shape. To the casual observer there really is very little difference. The same differentiation is broadly true for the leaves on the gorgets too. Not sure whether this is pre- or post-merger (I suspect it is the same pre-merger Strathclyde uniform). Note that the velvet backing of the gorgets is clearly dark blue, not black. Compare the shapes of the leaves on the caps and the gorgets and then compare these to the usual oakleaf designs. There are differences but they are very subtle. Post-merger, these may have been changed to the oak leaf type -- but who knows whether this was deliberate or just an oversight. It's even possible that no-one realised...! On another note, the bullion cap badges with the Scottish police thistle badge and the "Semper Vigilo" motto also clearly show the Scottish Crown rather than the St Edward's Crown. I found this larger picture http://i3.dailyrecord.co.uk/incoming/ar ... 924934.jpg the other day and had originally thought they were oak leaf variants. Having just googled 'thistle leaf' I'm inclined to agree with you. Still no luck with the ambulance service. Your big picture of CC House is still his former Strathclyde uniform but it definitely gives you a clear view of the "thistle" gorgets. In truth, the NHS ambulance services in the UK are very much regarded as "healthcare" organisations and are seen as an integral part of the National Health Service, albiet having a special emergency role within the NHS. Although formal uniforms are still worn for certain occasions this is generally relatively rare now and the ambulance services tend to have a more "managerial" structure than an "officer" structure. In many areas of the UK, rank markings for ambulance managers tend to be in gold on green uniforms (when uniform is worn) and, when formal uniforms are used, these are usually dark green with oak leaves and other peak embroidery on caps in gold and gorgets are also dark green with oak leaves or russia braid centre-cord in gold. I'm afaid I'm not up to speed with current Scottish Ambulance Service non-operational uniforms. The formal uniforms used to be dark blue jackets with silver insignia and buttons, white shirt with corporate navy blue tie and grey trousers with black shoes. Caps were dark blue with a green welt (I think), badges as above, and silver peak embellishments. Gorgets, where worn, were dark blue with (if I recall correctly) green leaves or central braid, depending on rank. I honestly have no idea whether they used thistles or oak leaves...! I equally have no idea what they use now -- or even if they still use any form of formal uniform at all. I still have a few contacts in the SAS (no, this one, not that one) so I'll see if I can find out for you.